ATA (Advanced Technology Assessment) is a business intelligence company developing a unique combination of knowledge-bases, software, technological solutions and expertise to support decision-makers in identifying actionable patterns in complex dynamic business environments. 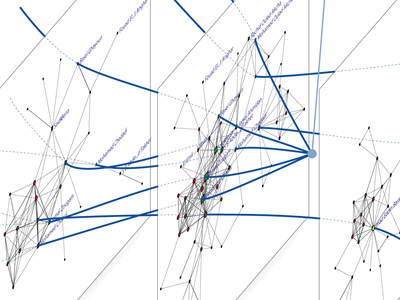 One of ATA's network visualization techniques is called Dynamic Network Rendering. The method supports effective representations of both static structural information and changes over time, which significantly boost understanding of complex relational datasets, and allow analysts to effectively gather competitive technological and organizational intelligence. 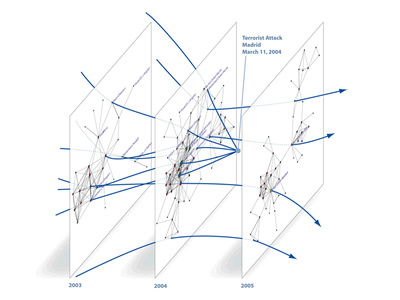 Representation of time evolution can be addressed from complementary perspectives that can be integrated into unified graph visualization solutions: Static Approach - networks are generated corresponding to "slices" of the original dataset at different points in time; Dynamic Approach - changes to network structure and node relative positions over time are conveyed by motion of graphical elements on the screen.